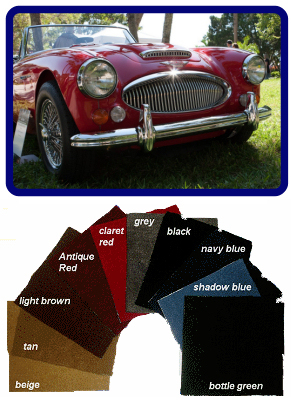 At Classic Car Carpets we specialise in replacement car carpet sets for your classic vehicle. All carpets are cut to the manufacturers original pattern and are made from the highest quality materials for longevity and ease of installation. You can also choose from a variery of different colours with optional underfelting to reduce road noise with fixers also available. Most sets Custom Made to Order and take upto 4 weeks for delivery within the UK, but we also have popular sets in Black on the Shelf. We ship throughout the UK, Europe and the Rest of The World so wherever your classic lives it can have a quality new made to measure carpet set, based on the original design pattern. We also supply quality tailored and fitted car covers for indoor and outdoor use via our main site known as Cover Your Car. All sites are part of 1st Portal Network Ltd.